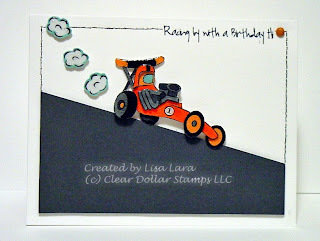 WHAT I DID:This cute race car worked perfectly for this challenge to use dimensionals. I stamped my car three times on white CS, colored, and cut out different parts for dimension and adhered the layers with dimensional. This sleek race car just was not complete without dimensional glaze for shine. Lisa absolutely LOVE your CAS...How fun this is, what a cool design!!! Great card, Lisa! I love the road you made! I think your Apple card was lovely and even though you made it the week of the challenge and not for the exact challenge you were totally right in entering it. Denise is pretty casual and will be so excited to see how awesome it is, she wont give it another thought:o) Good luck. Too stinkin cute! I love the hill look,awesome card.